Melt in your mouth delicious peanut brittle is cooked to golden perfection and contains only pure ingredients?no artificial colors or flavors! Available in 1/2 pound bags and 1 pound boxes. 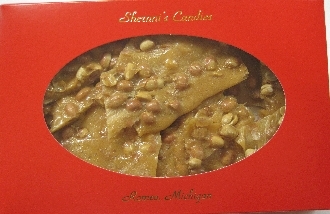 Copyright © 2008-2019 Shernni's Candies. All rights reserved.